They are for a 40mm ball. The ball holder is for a 3mm ball bearing; The bearing holders typically are designed to use M3 screws through the bearing hole and either screws through a 2.7mm diameter printed hole or sits on a 3mm diamater channel. Yeah this is awesome. Wondering if you could offer some assistance to a noobie? 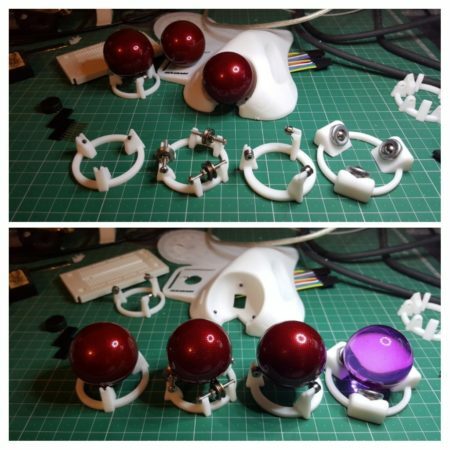 I’m a high level quadriplegic and I’m trying to design a trackball/joystick combination where the trackball will activate micro switches. Reason being is that I don’t have the arm strength to move a standard switch joystick. Please send an email if you have time, thanks in advance. I’ll love to be of assistance. My own project has stalled due to illnesses but I’m looking forward to kickstarting it again. What do you mean by the trackball activating microswitches? Typically the trackball is only used as the pointing device and separate buttons/switches that act as the ‘buttons’. What joysticks are you tried? I’m curious what a standard switch joystick is, I’ve seen builds for quadriplegics using ‘arcade joysticks’ which are limit switch based but I find them requiring a fair bit of force too. Thanks for your reply and I’ll see if I can explain my design idea. I currently have a raised desk that I drive my chair under and I control my PC using a mouth operated mouse/joystick, a QuadStick (love this thing). So I had a hole cut in my desk and installed a Zippy joystick (Sanwa copy) and had the shaft cut and machined down to fit a U shaped handle. Problem is it’s still to tall and because I have no feeling in my hands, when I play I can’t tell if my hand is on the joystick or if the joystick has turned/twisted. I also can’t get the handle to grip to my hand so forward and backward movements are extremely difficult. I have tried several joysticks (even an APEM microswitch joystick) and a number of different joystick tops (ball, T & U shaped). So I had an idea that it would be easier if I was able to rest my hand on the desktop and have a trackball that sits slightly higher than the desktop. So I thought I could combine a trackball top with a joystick bottom, basically have a trackball with a rod screwed in the bottom (rod would be slightly weighted so the trackball/joystick will self centre when left idle) the rod would activate micro switches when the trackball top was moved. This would make for a joystick that would need next to no force to activate because the ball top would be in/on a holder with minimal friction.